The girls’ every move is analyzed by millions of fans eagerly counting down to “Double Double Due Date.” They’re two of the most powerful teen girls on the planet, and they could do only one thing to make them even more famous. 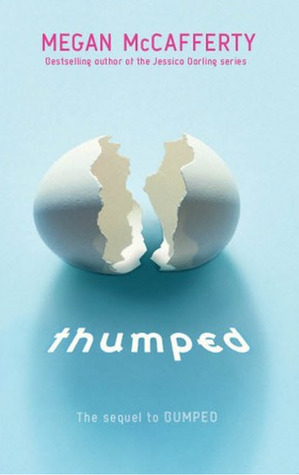 Bumped blew my mind and so when I see...Thumped...Heheheh, pun intended there. I see what you did there, Ms.McCafferty. Funny woman, you are. I seriously cannot wait to get my hands on a copy of this book. It looks amazing, like seriously. I haven't heard of this series, hope you're able to get your hands on it though, you sound really excited! I am really excited. Thanks!! Hope you get your hands on a copy soon! I haven't read Bumped, but my friend did, and she wasn't too keen (and we have really similar reading tastes), but I'm glad you enjoy it, and hope you get to read this one really soon! Its not for everyone, but, its a good read. Thanks!